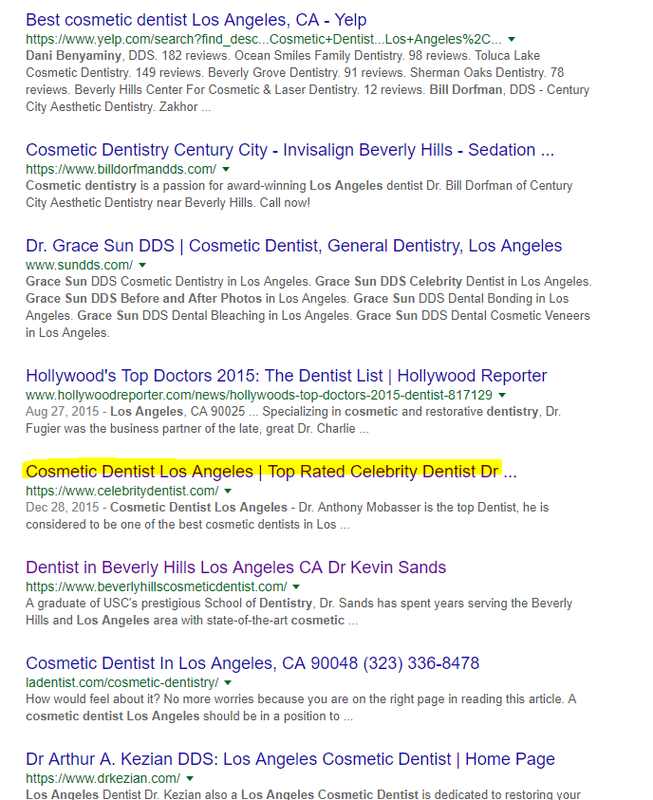 Dr. Anthony Mobasser, well-known as the “Celebrity Dentist” in Hollywood and surrounding areas, hired Websites Depot services to build a web platform and digital marketing strategy. Dr. Mobasser has been working with Websites Depot since 2013, and has entrusted the company with the development of his website www.celebritydentist.com, along with a focused and effective marketing strategy that includes monthly blogs, social media posts and many other on demand ala carte services. Additionally to the need of a major upgrade in his digital platform, Dr. Mobasser was dealing with a harder situation. Before working with Websites Depot, his old site received a penalization by Google that pulled his rankings down. Such penalizations are pretty harsh and making a website rank again is quite challenging. As a Premier Google Partner Agency, Websites Depot could remove Mobasser’s penalization and then focus on performing the major upgrade and subsequent SEO strategy that the website needed to reach wider audiences not only in the area but worldwide. The platform of choice to develop Dr. Mobasser website www.celebritydentist.com is WordPress, specifically, our custom version known as Shuttle. With Shuttle, we have engineered a custom framework that optimizes site speed and responsiveness, which are two critical factors for Google indexing based on new algorithm updates, and it is also optimized for brand customization. The site was also built specifically for SEO, meaning that the code beneath the site was calibrated specifically for efficient indexing and search visibility around business related keywords. Recently the site, www.celebritydentist.com got a facelift with a more appealing design, new images, additional information about Dr. Mobasser’s accreditations and a video section. We have a highly collaborative relationship with the client, and their team’s feedback is a valuable tool for Websites Depot to refine goals, target and reporting on a continual basis. After solving the penalization and web design upgrade, the main SEO objective for Dr. Mobasser was first page positions for his site for most of their keywords on all major search engines within 3-9 months of project initiation. Less competitive keywords provided results in 60 days or less. The most competitive keywords took a little longer, but positioning was still achieved. For quicker results, our strategy included professional grade paid search campaigns. Thanks to our monthly efforts, the ‘Celebrity dentist’ not only recovered his online presence but greatly increased it. He receives clients not only in the Hollywood area but all around the world as well as celebrities like Tyler Perry and Shemar Moore. His professional and marketing efforts has made Dr. Mobasser listed among “Southern California’s Top Dentists” for three years in a row by Los Angeles Magazine.